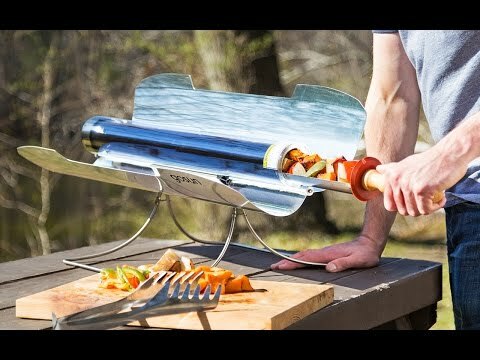 Whether you’re on your deck, on a hike, or at the beach, the GoSun solar cooker lets you make a meal using only the sun. The design channels heat into a vacuum tube and reflectors (which you angle toward the sun) help speed up the process. It’s so efficient that the inside can reach 550°F on a clear day—but GoSun works on cloudy days, too. Leave the charcoal, wood, or propane behind and cook fuel-free. Instead of using propane, gas, or charcoal, why not cook a meal with the sun? 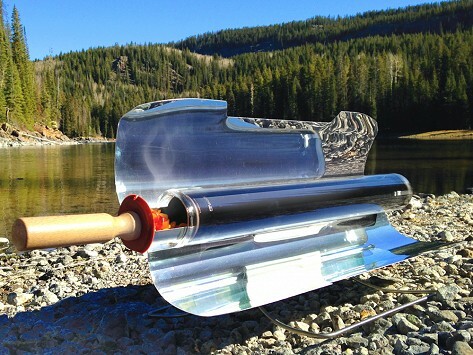 The GoSun solar cooker is a fuel-free, green way to cook—at the beach, while camping, or just in the backyard. Inventor Patrick Sherwin is a solar energy expert. After disassembling a solar water heater, Patrick noticed the vacuum tubes were still hot enough to reheat his lunch. It inspired the idea for a solar oven. GoSun uses an evacuated glass tube to absorb sunlight and convert it to heat. Just open the reflective panels and angle them toward the sun. It’s so efficient that you can even cook on a cloudy day, it just requires a bit more time. Cut food into small pieces to cook more quickly and better fit the tray. We suggest lining the tray with aluminum foil or parchment paper for easier cleanup, too, and using a fork or tongs to remove food. Even though the outer glass is cool to the touch, the inside can reach up to 550°F. Take GoSun tailgating, on a picnic, or on a hike. All you need for a hot meal is a little sun.